Why is the Stock Market So Divided? From a performance perspective, markets continue to experience mixed conditions that carry an undercurrent of emerging-markets instability and US strength. This is consistent by broad asset class–whether we are talking about equities, fixed income or currency – but also in rhetoric. Looking at equities first, the performance numbers have been reasonably resilient, albeit with significant dispersion. On a strict US versus emerging markets pairing, emerging markets continue to be pressured and have done since they peaked in January. Most recently, we have seen a small bounce back, helped by a Russian boom of over 10% in September, but offset by market stress in India, which fell almost 10% over the same period – in US dollar terms, even worse in local-currency terms. For longer-term perspective, we find that broad emerging-markets equities have delivered 45% over the five years to 30 September 2018, but even less if priced in US dollars at 19%. This compares to US equities which have now rallied 92% and technology companies a staggering 145%. Other major regions have experienced mixed outcomes too, with Japan having another great month and now up 86% over five years, compared to Europe at a relatively subdued 43%, all in local currency terms. We note that we’ve highlighted the five-year numbers above, however the sizeable dispersion between the US and the rest of the world is evident regardless of whether we look at it on a one-, three- or 10-year horizon. Considered holistically, it is the magnitude of the dispersion that is having the most profound impact on our thinking. The typical course of action is to ponder why this divergence has occurred and whether prices reflect reality. In this regard, we can point to several developments that are openly discussed among pundits. 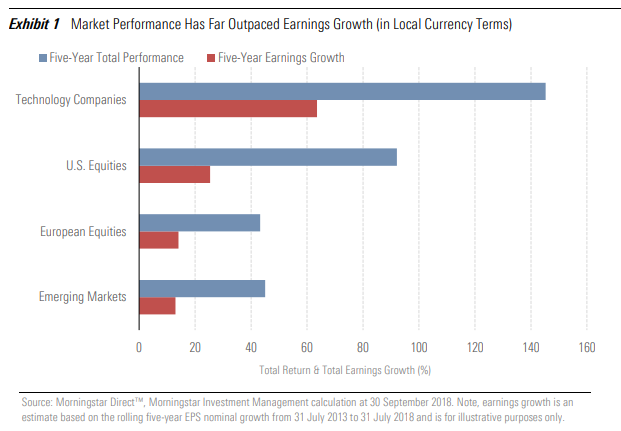 From trade war tensions to earnings growth upside, part of this performance differential is perhaps justified in the economic vagaries. Yet, the magnitude is worth further thought, especially if we account for emerging markets currency weakness. Perhaps the simplistic answer is that many investors are avoiding assets that are exposed to well-known challenges. Emerging markets and pan-Europe, including the UK, continue to stare at economic and political vulnerabilities. These concerns are valid, of course, but are now priced to such a level that the risk-adjusted returns are quite favourable according to our analysis, at least in a relative sense. For instance, the increasing probability of a “no-deal” Brexit is worthy of concern, but extremely difficult to price. Therefore, we suggest that many investors likely have stage fright, preferring to hold the parts of the market that aren’t surrounded by such controversy. We shouldn’t predict but we can prepare. A big part of an investor’s job is to understand where risks lie– whether that be fundamental, such as excessive leverage, or valuation-driven, meaning overpaying for an asset. By acknowledging the latter, we see just as much risk, if not more, in herding towards the popular outperformers of recent years. We should also consider the currency impact. 2018 has been marked by US dollar strength, which is having a significant influence on investor returns. In a forward-looking sense, this carries a greater degree of uncertainty, yet adds greater emphasis on the hedging decision and has exacerbated some of the challenges faced in emerging markets. We know that as bond yields rise, bond prices fall, all else being equal. So, while we want to avoid predicting the next moves by the central banks, the interest rate trajectory has certainly been upwards. Therefore, while acknowledging the potential range of outcomes, this should lead us to favour the assets that are furthest along the tightening cycle, or, for credit, those that offer the biggest yields as a buffer against something going wrong. Under this lens, fixed income has been a challenging asset class of late. Currency impact aside, 2018 has delivered muted returns, with an orderly progression of government bonds beating corporate bonds, followed by emerging-markets debt. Interestingly, September saw a partial reversal of this development, as emerging-markets debt clawed back some of its prior losses. We continue to face several issues that impact portfolio decision-making. Animal spirits are always surrounding us, but this feels especially prevalent late in the investment cycle. The good news is that the longer-term developments are creating opportunities for those focused on fundamental diversification and valuation-driven analysis. It is in this common-sense approach that portfolios can be positioned in such a way that aligns outcomes with goals. Do Soaring Profits Justify US Stock Market Valuations?